Back home now but finding it hard to concentrate after the traumatic events of the past five weeks. Anyway, it's time for an update on the SFG and other things. Except for a few small patches the snow is entirely gone. Yesterday's temperature was about 26C (79F) but today is much cooler at 9C (49F). 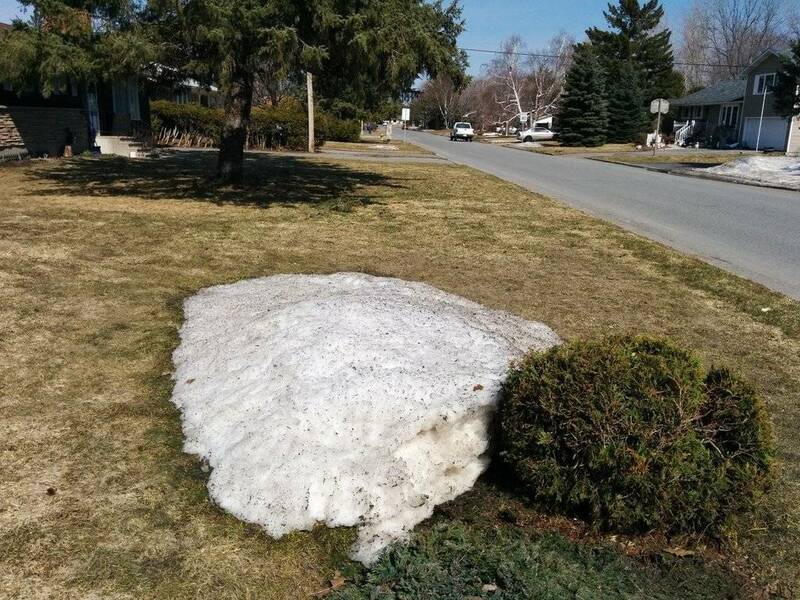 Here is the one remaining patch of snow on our front lawn. Here are the SFG beds. 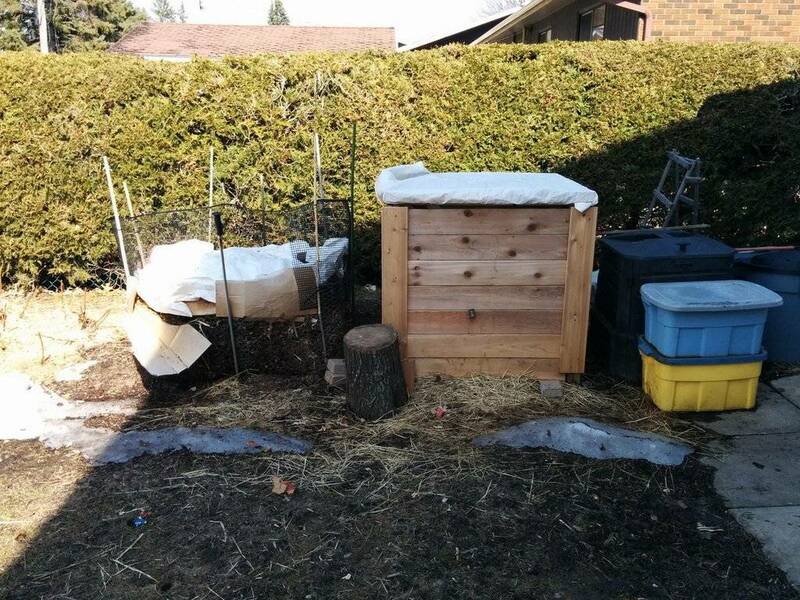 The compost bins. I checked inside the plastic bin and it is still frozen in the middle. The goldfish that survived the winter. 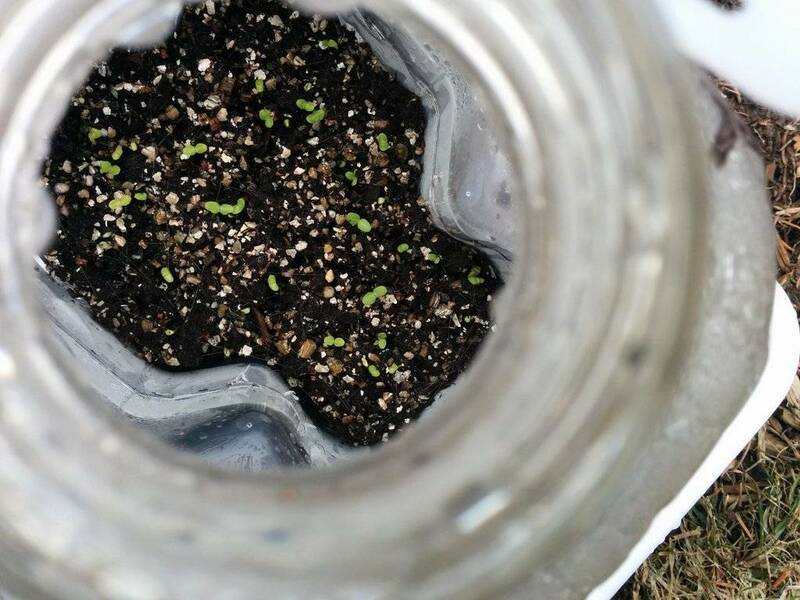 Here are some lettuce seedlings outside in their Winter Sowing container. 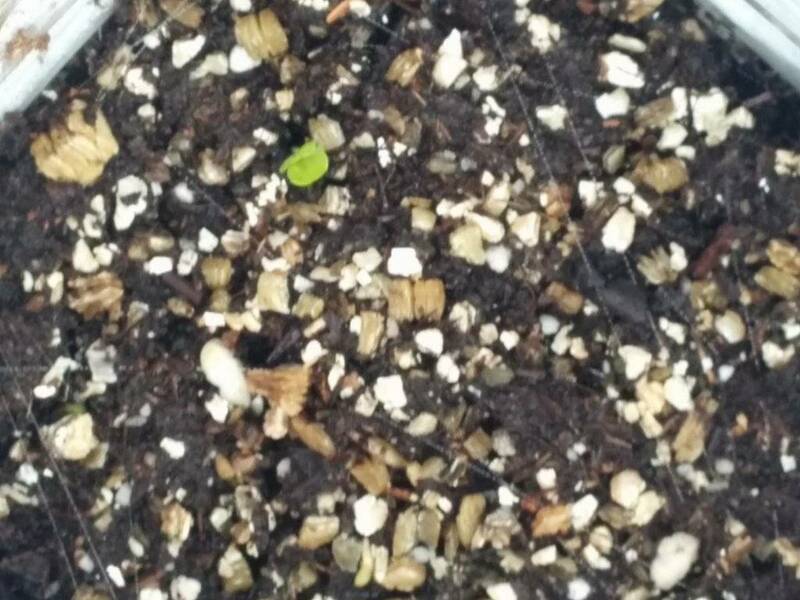 I think this is kale in a Winter Sowing container. So far winter sowing has not been a success for me. The garlic (green shoot in the middle) has come up. 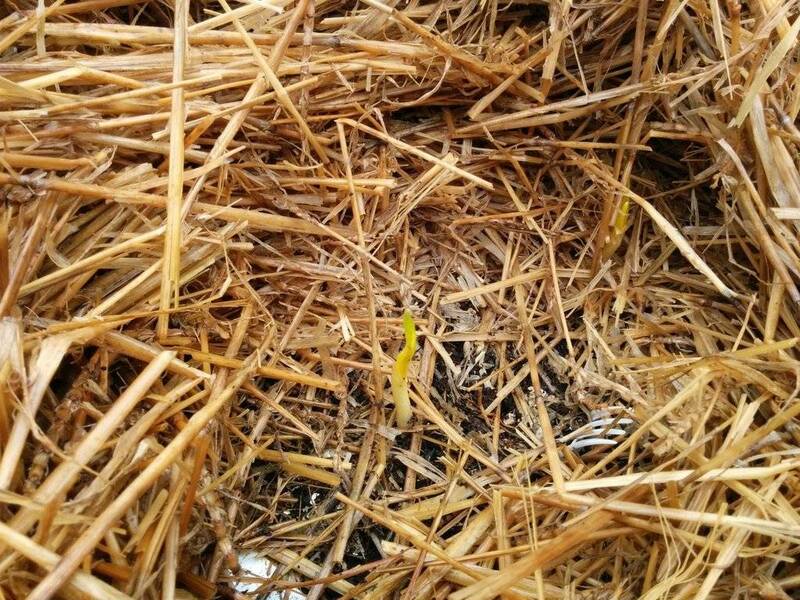 Should I remove the straw mulch? We are still over a month away from our last frost date. Welcome home! Hopefully, after the 5 weeks you just experienced, you will feel more grounded as you resume normal activities. TD, welcome home! 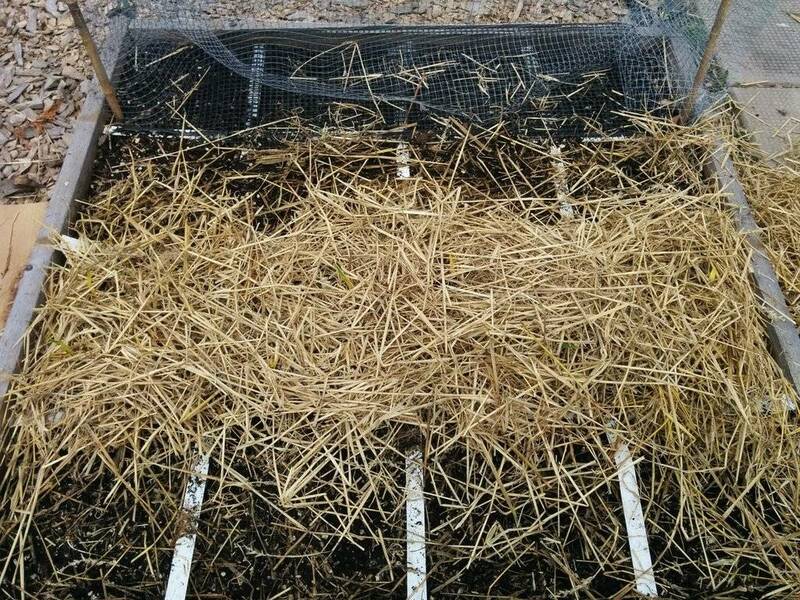 If the weather is behaving I would remove the straw mulch to the ground next to the box to be at the ready just in case. But it would take a pretty hard frost to kill them. Hi TD- I had no mulch and my garlic plants seem to be doing just fine. They are in a sunny warm spot though. And this is my first year trying garlic. @Mimi2 wrote: Hi TD- I had no mulch and my garlic plants seem to be doing just fine. They are in a sunny warm spot though. And this is my first year trying garlic. I think I will take off most of the mulch but leave a little on top of the MM and around the garlic sprouts. I've been thinking that because of recent events in my family, I must be way behind in getting some seeds started indoors. So I went back through my "Second Year SFG in Canada" thread from last year. It appears that I still have a chance to get things going. I finally got around to starting some seeds indoors that I probably should have started last week. Thanks for the reminder! I need to start my marigolds and zinnias as soon as I get home from this hospital, which is today by the way. Yay! I turned on the pump for the waterfall in the goldfish pond. 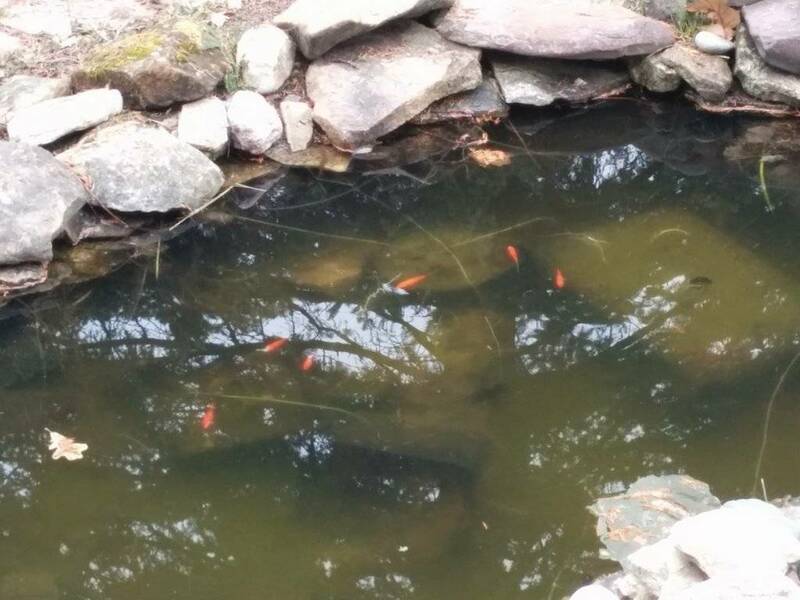 Looks like 7 fish survived the winter. The pond is not deep and often freezes to the bottom. I expect that the deep snow covering (we got over 300 centimetres) this winter provided some good insulation for the pond. 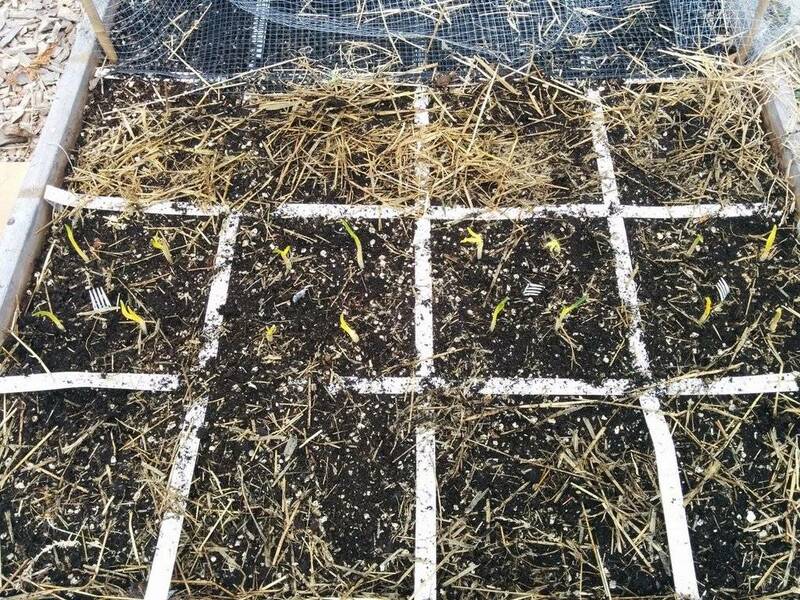 Here is my analysis of the Winter Sowing experiment. 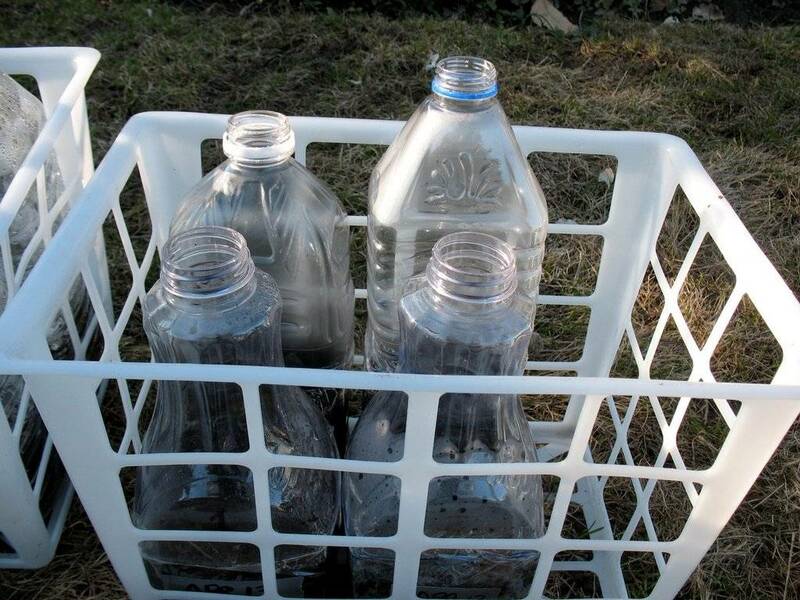 The dates are when the containers were sown and placed outside. I'm wondering if Feb 4 is too early to set them out in my climate. I'm going to do up some more to see what happens with a mid April sowing. 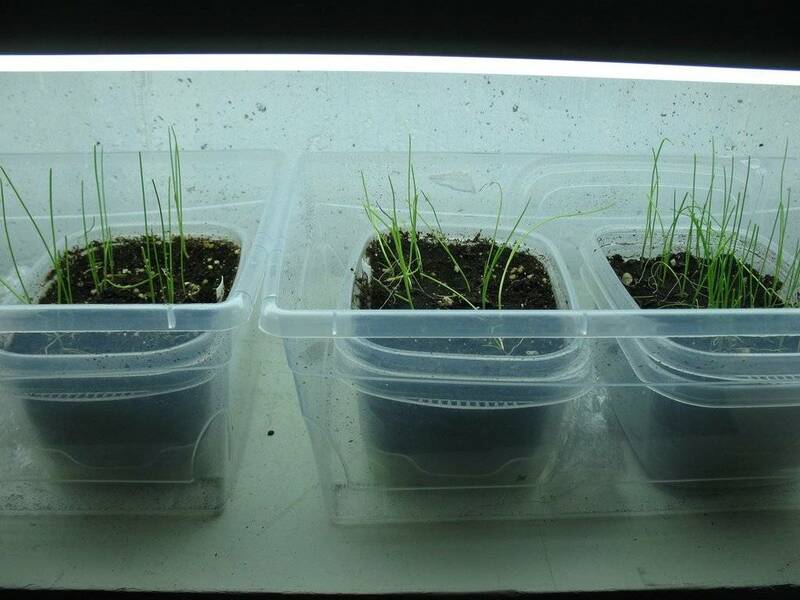 I still have a bunch more containers to sow if I find the time. I also need to get my indoor sowing started. Here are the new containers positioned outside. 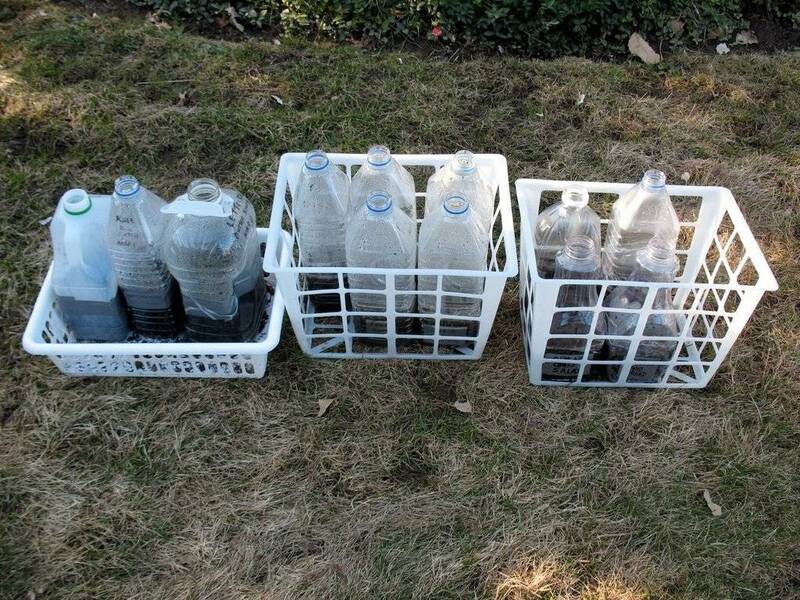 Here are all the containers sown so far. 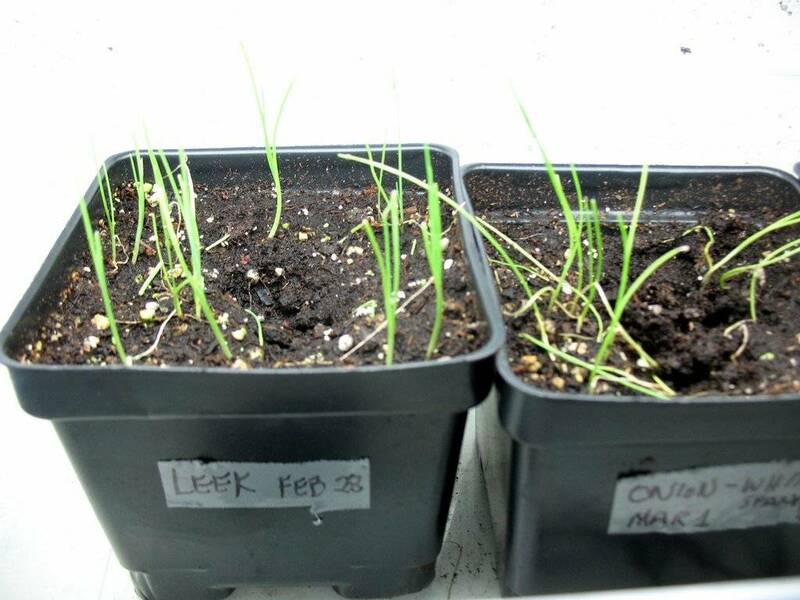 The Leeks and Onions that travelled with us over the past few weeks. More of the travelling Leeks and Onions. And there are signs of life in the front yard flower bed. I am not sure, but aren't Zinnias and ConeFlowers warm weather flowers. Maybe it is just not warm enough in your area for them to germinate at this time. @yolos wrote: I am not sure, but aren't Zinnias and ConeFlowers warm weather flowers. Maybe it is just not warm enough in your area for them to germinate at this time. Indeed they are. It was an experiment based on some information I got from a Winter Sowing website. @CapeCoddess wrote: Thanks for the reminder! I need to start my marigolds and zinnias as soon as I get home from this hospital, which is today by the way. Yay! Hope everything is good? Let us know how you are. 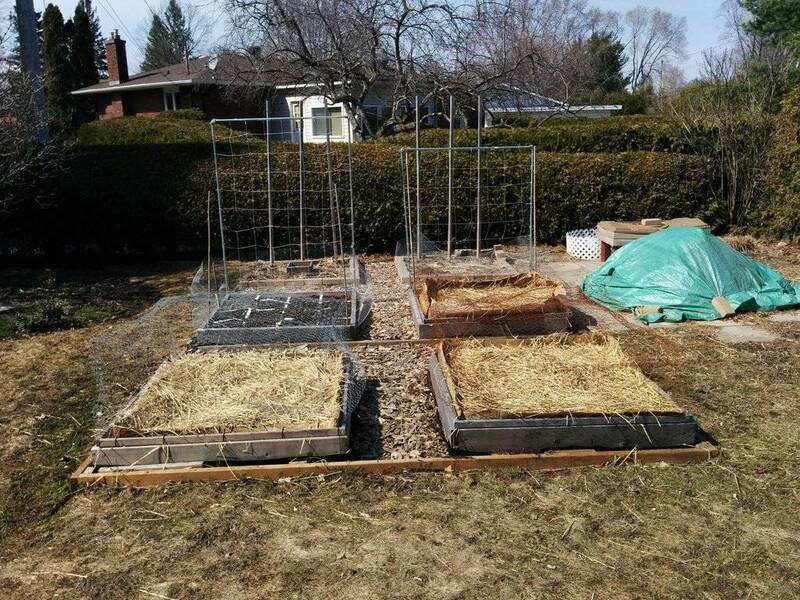 I decided to take off the thick layer of straw mulch that was on top of the two beds that have some squares planted with garlic. Then I put back a thinner layer of straw on the squares that have the garlic. Now this is a bit disconcerting. This is what the inside of my top hat looks like after less than one year of use. This wood is 3/4 inch thick. Makes me wonder what the 2x8 lumber used for my 4x4 beds is like, especially those that are going into their third year. My garlic tops are a dark green. 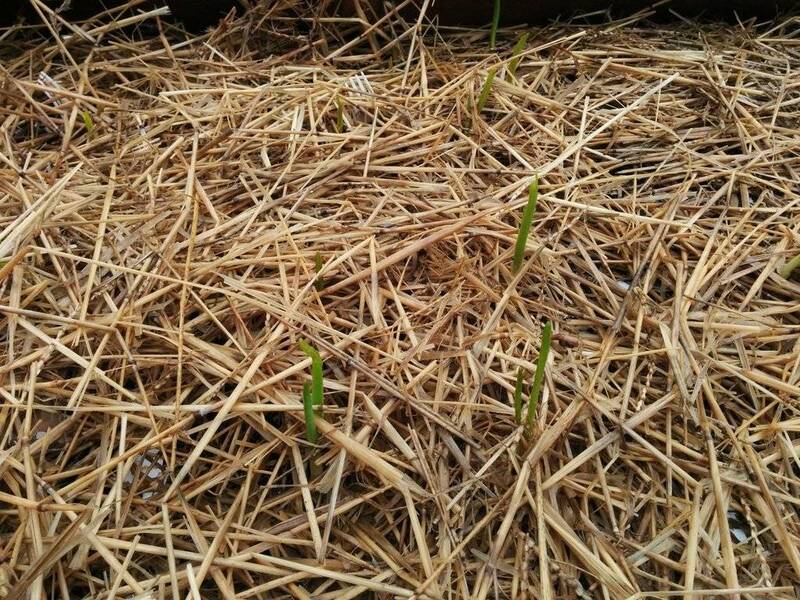 This is my first year growing garlic- so I'm no expert, but is your garlic getting enough sun under the mulch? @Mimi2 wrote: My garlic tops are a dark green. This is my first year growing garlic- so I'm no expert, but is your garlic getting enough sun under the mulch? Nope. The mulch was too thick and it was really wet and compacted under the top layer. I put back just a thin layer. Hopefully the garlic will green up now. I see, yes,they'll green up in no time. 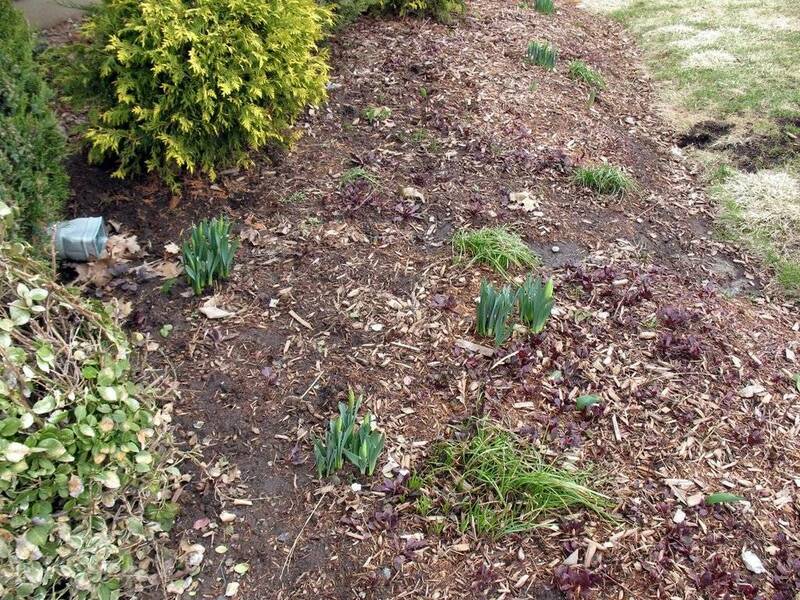 I have the same thing happen to my daffodils every year as they push up through the mulch, and they're right as rain as soon as they get enough sun light. 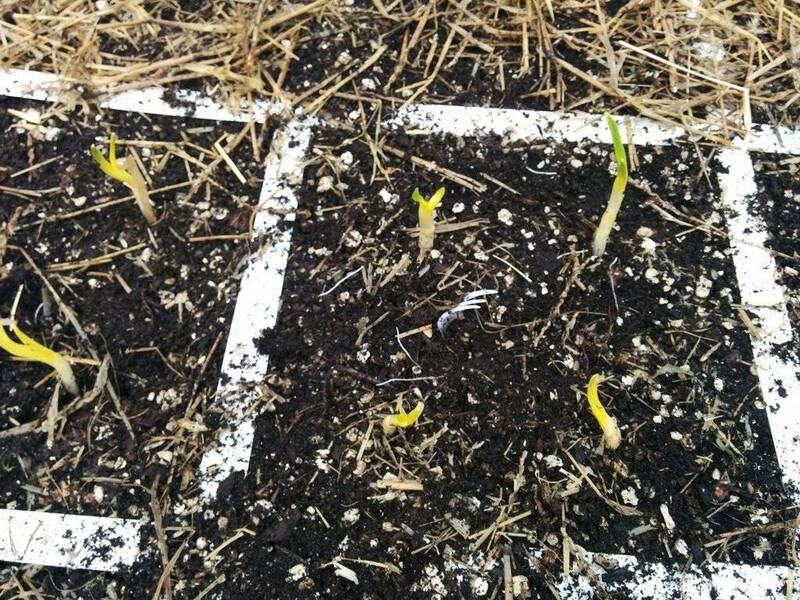 I'm just learning how to grow garlic, myself, but I'm pretty sure if you see any green at all, it won't take much to get them in their happy place. I thought they were pretty cold hardy, so I'll be interested to see how they do after you remove the mulch to expose them to more sunlight. @trolleydriver wrote: Now this is a bit disconcerting. This is what the inside of my top hat looks like after less than one year of use. 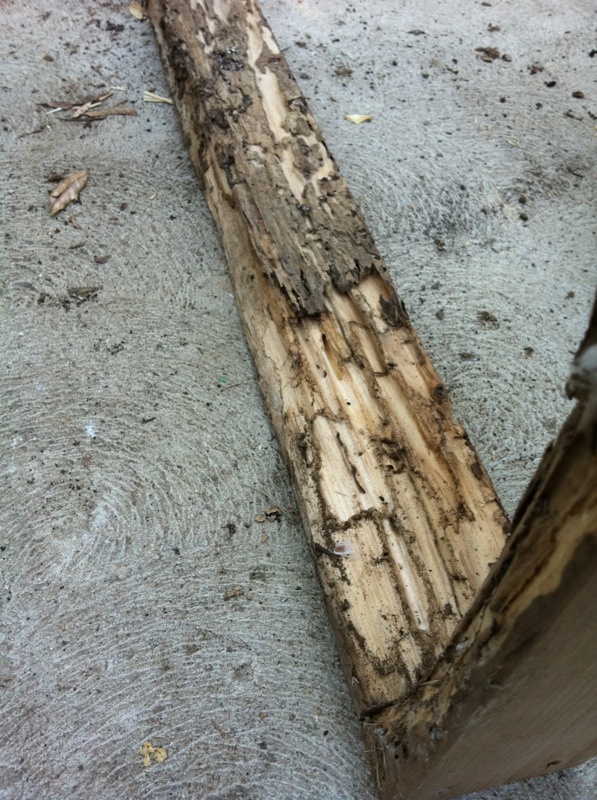 This wood is 3/4 inch thick. Makes me wonder what the 2x8 lumber used for my 4x4 beds is like, especially those that are going into their third year. That is understandable. I know my boxes that were down for 5 years were about to fall apart on their own before I emptied them. I guess you could dig out one of the squares to have a little looksy. I just built my top hats out of scrap 3/8" plywood which I lined with plastic. Hopefully they will last more than one season. TD, Don't look! When the boxes start to pull apart, it's time for new frames. The 2" x 8" will last longer than the 3/4". My boxes are mostly made of 2" x 4" studs stacked 2 high or 3 high. 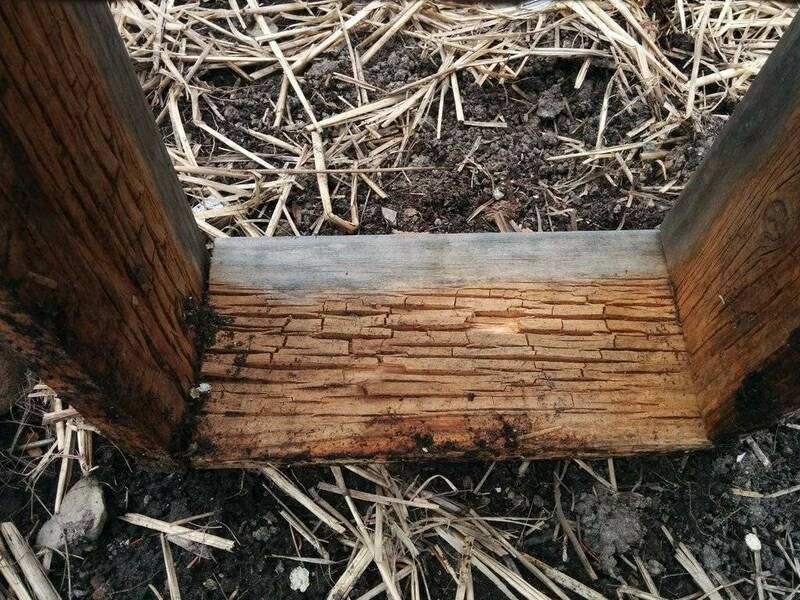 When I realized the tree/bush/rose roots were invading through the bottom of the boxes and they all had to be raised off the ground, this is what one bottom frame looked like after 18 months. @sanderson wrote: TD, Don't look! When the boxes start to pull apart, it's time for new frames. The 2" x 8" will last longer than the 3/4". I think the boxes going into their third year should be OK but may need to be replaced next year. I was hoping to get a minimum of five years out of them. BTW I can't resist taking a peak even if it is scary. On another subject, we have our daughter and family visiting with us this Easter weekend. Our son and family were here the past two days as well. My daughter is a veggie gardener but uses a traditional soil approach. I have not been able to convert her to SFG. My son said he will be building an SFG box for his kids next weekend. And as for me, I need to get more seeds started before it is too late. As well, I would like to have at least one more 4x4 bed. I still have to put together my mini-greenhouse. Add in settling an estate and doing 3 individuals income tax returns (before April 30) and I feel overwhelmed. My escape is this SFG forum. Already after just one day the garlic is greening up nicely. 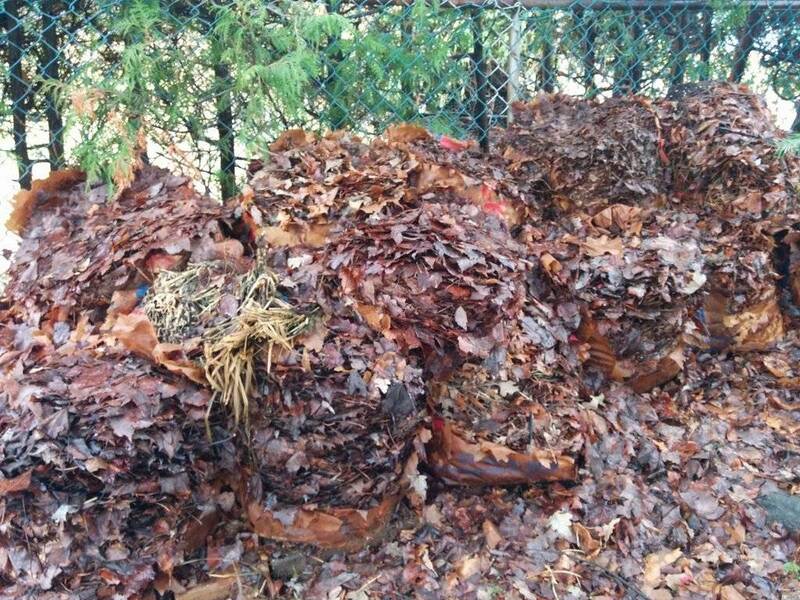 Here are the leaves that I gathered last Fall and stored under our big pine tree. The paper bags have disintegrated. Lots of material for the compost bins. Moving right along there, TD. We northerners are getting our engines revved! I envy those leaves for my potatoes. It sure is nice to see garlic poking up, and no snow! I'm thinking of planting radishes in the same squares as my garlic. Is that a good or bad idea?